William Robert Wood (known as Robert) was born on 13 November 1949 in Gateshead, UK. His father, William Ernest Wood, was a steelworker, who in 1946 had married Lidia Tittavelli at Iesi, inland from Ancona on Italy's Adriatic coast. The family emigrated to Australia as 'ten pound Poms' when Robert was thirteen years old. Like all British subjects permanently residing in Australia and registered on the Commonwealth Electoral Roll prior to 1984, Robert was entitled to vote once he had reached the appropriate age, but he was not automatically an Australian citizen, a fact which was to trouble him in the years to come. Wood completed high school in 1967 at De La Salle College, a Catholic school in Ashfield, in Sydney's Inner West. In the 1970s he completed an Associate Diploma in Social Welfare at Sydney Technical College and a Diploma in Outreach Work at the National YMCA College in Melbourne, but interrupted an Arts-Law degree at Macquarie University in 1985 to dedicate more time to politics. Social justice activism was a hallmark of Wood's life and career. 'I had a fairly poor background, so I was always pretty close to injustice', he told the Canberra Times in 1987. He also understood the power of the media to publicise his causes. A draft resister, in May 1972 Wood travelled to Parliament House in an attempt to meet with the Attorney-General, Senator Ivor Greenwood in front of assembled journalists. In an event that sparked a lengthy Senate discussion on civil liberties, Wood was arrested, charged with an offence against the National Service Act and gaoled for more than a month. Writing from prison, he sent his family and friends greetings from 'Her Majesty's happy holiday camp' and said the time was invaluable for 'prayer, reading and thinking'. Wood recalled that the Vietnam War 'led to an examination of where I stood. Although I started out with a Christian pacifist perspective on the war, that was very rapidly turned into an understanding of injustice generally; that war is just a symptom of greater underlying injustices in society'. He continued to act on his beliefs. He was an anti-apartheid activist in the 1970s and, after the birth of his two sons, became even more determined 'to work towards a safer, more peaceful world'. He was a founding member of the Sydney Peace Squadron, a coalition aiming to provoke public debate about the presence of nuclear-capable warships in Australian waters. He also helped establish the Squadron's kayak contingent, Paddlers for Peace, and was involved in several colourful protests on Sydney Harbour. In 1992 he described his professional career as 'youth work, community development and social planning'. 'Most of my life's work has been with the marginalised in society—aboriginal youth, street kids, migrants, drug abusers, child prostitutes and the homeless'. Wood's activism was a good fit with the agenda of the Nuclear Disarmament Party (NDP). Formed in 1984 and fronted in New South Wales by prominent rock singer and activist Peter Garrett, the NDP had an immediate impact, with Garrett almost securing a Senate seat for NSW in the 1984 federal elections and Jo Vallentine elected for Western Australia. The party's core platform was narrowly defined: it opposed foreign military bases and nuclear weapons in Australian territory, and the mining and export of uranium. After the 1984 election, however, the NDP fractured, and a number of its key members (including Senator Vallentine and Garrett) resigned from the party. The division was widely attributed to infiltration of the NDP by Socialist Workers' Party members. The NDP never recovered the public profile it had achieved in 1984, although many anti-nuclear activists remained in the party. Wood was a member, a spokesperson from 1985, and stood as an NDP candidate for the NSW Legislative Assembly in the Vaucluse by-election of 1986. Wood's parliamentary career was beset with difficulties from the beginning. He reportedly nearly missed the declaration of the poll because he was searching Sydney's Central Station for his sons, who had failed to arrive on their train to the city for the event. Within an hour of being declared elected he had to rush to court to appeal a fine imposed for obstructing the US warship Joseph Strauss with his kayak. Then in August 1987, Elaine Nile of the Christian conservative Call To Australia Party petitioned the High Court of Australia to find Wood's election invalid, arguing that under section 44 of the Constitution he could not hold office for several reasons, including his gaol term and his anti-nuclear protests which, she alleged, indicated 'allegiance, obedience or adherence to a foreign power'. The case was dismissed by the High Court, sitting as the Court of Disputed Returns. Described as being '[p]robably the only Member of Parliament to have been elected while on the dole', Wood the man was as unorthodox as the manner of both his arrival and departure from Parliament. Asked to provide biographical information to the Parliamentary Library, his mock response began: 'Robert Wood was born on the planet Krypton in the intergalactic year –42½, which makes him 4,797¼ years old ... at last count'. 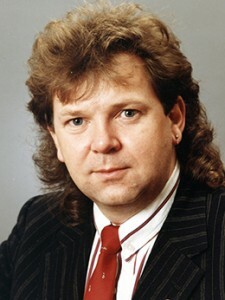 With long hair, an earring and bright clothes, he stood out personally as well as politically. Wood made his first speech on 28 October 1987. In the following six months, concerned about the broader implications to Australia and the South Pacific arising from the arms race, his contributions often focussed on Australia's international relationships and alliances. He claimed that 'we need a republican consciousness in this country' because Australia 'has never declared its independence'. He rejected Australia's dependence on foreign powers, particularly the United States, and wondered at Australians' lack of awareness about their own national identity. Wood was critical of the ANZUS alliance, foreign intelligence-gathering facilities in Australia, and French colonialism and nuclear testing in the Pacific, and continued to express his longstanding concerns about apartheid in South Africa. Wood was also deeply concerned about Indigenous affairs, saying non-Indigenous Australians needed 'to understand our original aggression in this country'. However, he drew hope from the fact that 'Aboriginal people have never surrendered their sovereignty'. While Wood acted independently in the Senate, his vote was usually aligned with that of the Australian Democrats, whether opposing the rest of the senators in the chamber in divisions, or voting in conjunction with Labor or the Opposition. The Democrats having the balance of power at that time, Wood's vote was not ever a determining factor in a decision of the Senate. Seeking to travel overseas, Wood applied for a passport and was 'stunned' to discover that he was not an Australian citizen. On 28 January 1988 the Deputy Secretary of the Department of Immigration, Local Government and Ethnic Affairs wrote to the President of the Senate, informing him that Wood had applied for Australian citizenship. Although Wood was granted citizenship within days, the Deputy Secretary's action set in motion a prominent court case, for, under the Constitution, a person must be an Australian citizen if they are to be elected to the Australian Parliament. The Senate referred the matter to the High Court, once again sitting as the Court of Disputed Returns. Wood wryly noted the coincidence of his predicament with the reorganisation of furniture in the chamber at the time: 'It is one of those nice touches of irony that all of us came back today to find that our seats were missing; we are sitting on chairs instead'. But there was to be no seat for Wood. On 12 May 1988 the court found that he had not been validly elected. His seat in the Senate was vacant: Wood was no longer a senator. The High Court determined that the Senate place should be filled by a recount of ballots cast in the election. Following a recount, Irina Dunn, who had been second on the NDP ticket in 1987, was declared elected. Wood received the backing of the NSW branch of the NDP to ask Dunn to resign the seat, so that Wood (now a citizen) could be chosen for the resulting casual vacancy. But Dunn was having none of it, citing Wood's incompetence, the risk of disillusioning previously sympathetic voters, and the dangers of relying on the NSW Liberal Government to observe a convention governing casual Senate vacancies that had recently been ignored by the Liberal Government in Tasmania (although the 1977 amendment to the Constitution required that a replacement senator must be of the same political party as the vacating senator, it did not require that a replacement be made). After the NDP moved a motion of no confidence against her, Dunn resigned from the party and served the remainder of her two years in the Senate as an Independent; Wood was left to pursue new challenges. Ejected from the Senate during an economic downturn, Wood found himself raising a family while unemployed and struggling to recover superannuation contributions he claimed had been 'confiscated' by the government. Wood's loss of his seat did not diminish his commitment to politics or to activism. In 1989 he was arrested and later fined in connection with peace protests at the Joint Defence Facility Nurrungar. He was an NDP candidate for the NSW Senate contest in the 1990 federal election. He outpolled his former colleague-turned-rival Irina Dunn, but neither came close to winning a seat. After these experiences, Wood abandoned the NDP. He became involved with the Australian Democrats, indicating his support for policies that were 'ecologically sustainable, economically equitable and based on fundamental principles of justice'. He was an office holder in the New South Wales division of that party in the early 1990s before moving in 1992 to Victoria to start a new job. Wood was soon involved in the Victorian division, at that time in turmoil following the removal of Senator Janet Powell as the party's parliamentary leader. He became a member of the state executive, co-edited the newsletter for a period, and was nominated as the party's lead candidate for the Senate at the 1993 election. However, with six senators to be elected and a quota of 14.3 per cent, the ALP and the Coalition took three seats each. Wood was again unelected, despite achieving a much higher primary vote (just under four per cent) than when he was successful in the double dissolution election of 1987. Wood continued to be involved in the Victorian division of the Australian Democrats for a period, but although re-elected to the state executive in 1994, he was unsuccessful in 1995. Advertiser (Adel. ), 23 Jan. 1988, p. 27; Personal communication between Robert Wood and the author; Typescript CV, ; CT, 12 Nov. 1987, p. 19; CPD, 18 May 1972, pp. 1857–72, 16 March 1988, pp. 863–4; Letter from Metropolitan Remand Centre, Robert Wood, 22 May 1972; Media Release, Australian Democrats, 4 Dec. 1992. Drew Hutton & Libby Connors, A History of the Australian Environment Movement, CUP, Cambridge, UK, 1999, pp. 224–6; Elim Papadakis, Politics and the Environment:The Australian experience, Allen & Unwin, St Leonards, NSW, 1993, pp. 180–2; Michael Denborough, 'A brief history of the Nuclear Disarmament Party', NDP, March 1985; Ken Mansell, 'Making Sense of the NDP Split', Peace Studies, July 1985, pp. 19–20; Jo Vallentine, 'Defending the fragile planet: the role of a peace activist' in C. Jennett & R. G. Stewart (eds) Politics of the Future: The Role of Social Movements, Macmillan, South Melb., 1989, pp. 56–75; WA (Perth), 22 Aug. 1987, p. 19. CT, 12 Nov. 1987, p. 19; Advertiser (Adel. ), 23 Jan 1988, p. 27; SMH, 21 Aug. 1987, p. 1; Australian (Syd. ), 26 Aug. 1987, p. 3; Elaine Nile v. Robert Wood and Another  HCA 63; Ian Holland, 'Section 44 of the Constitution', E-brief, Parliamentary Library, Canberra, 2004; CPD, 28 Oct. 1987, pp. 1415–18, 24 March 1988, pp. 1306–8, 25 Nov. 1987, pp. 2393–5, 20 April 1988, pp. 1742–5, 16 March 1988, pp. 863–5. CPD, 16 Feb. 1988, pp. 3–16; Re Wood  1967 CLR 145; Australian (Syd. ), 8 June 1988, p. 3; Herald (Melb. ), 17 Aug. 1988, p. 11. Transcript, ABC Radio, 'Morning Show', 23 Aug. 1988; Advertiser (Adel. ), 15 May 1990, p. 5; Media Release, Australian Democrats, 4 Dec. 1992; Australian Democrats, Victorian Newsletter, Oct. 1992; CT, 13 Feb. 1993, p. 4. This biography was first published in The Biographical Dictionary of the Australian Senate, Vol. 4, 1983-2002, Department of the Senate, Canberra, 2017, pp. 78-81.